In his new Lucan theology, A Theology of Luke and Acts, Darrell Bock spends a couple pages on philosophy of history in view of postmodern readings. The postmodern philosophy of history, an age that Bock notes, "define[s] history itself as a construct and a type of fictive act," adds a new dimension and challenge to biblical scholarship. 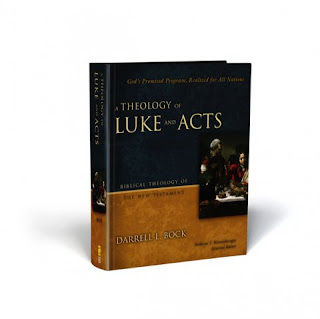 The battle over Luke as a legitimate historian may have progressed in many ways, but postmodern definitions of history requires more interaction, which is what Bock does in his Theology. First, Bock interacts with Daniel Marguerate, and his work The First Christian Historian: Writing the Acts of the Apostles." Under the influence of Ricoer, Margueate claims, "historiography should not be regarded as descriptive, but rather (re)constructive (5-7)." Second, Bock dialogues with S. Shauf, and his work Theology as History, History as Theology: Paul in Ephesus in Acts 19. Shauf represents for Bock a popular postmodern reading, that "sidesteps the historicity question by defining histoiography as 'imaginative narration' simply because the historian assembles a narrative from already limited sources." E.A. Clark who also represents this second view (in History, Theory, Text: Historians and the Linguistic Turn) says, "The critic's task, then, is to show how 'seemingly politically innocent objects, forms subjectivity, actions, and events" are the effects of power and authority... (176)" Bock simply replies, "this type of ideological deconstruction itself needs deconstructing... Luke does not write from a position of power and authority." Bock concludes this section by a couple reminders, as I will call them: (1) "classical historians respect Luke as a historian as they use him;" (2) "a careful look at the details of Acts shows that, where we can check his accuracy, Luke is a credible historian." I highlight this section in Bock's Lucan theology, because through my years in seminary and now in my research I have not yet seen such an interaction in any of the introductions or commentaries I perused (It could also be that I simply missed these sections at the pace of reading in seminary...). This is a helpful dialogue Bock includes.